You can not imagine how easy it is to learn. If you want to every little piece that you read, see or hear can enrich and advance your bag of knowledge. You never know when you are going to use what you learn, but one day you will not regret that you born this baggage. This time it was this neat post by Seth Godin. Simple yet powerful message, but there was one word that really caught my eye: "Moleskine" . Did you know that Vincent Van Gogh, Pablo Picasso and Ernest Hemingway used the same notebooks and were all called Moleskine? I didn't. 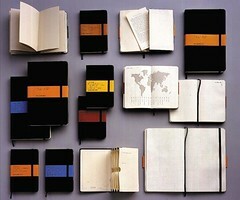 It is really interesting that many of the sources referred to Moleskine as "legendary notebook". Some people argue that one should not buy Moleskines as they will not make him Hemingway or Van Gogh anyway and some no-name "set of sheets of paper put together" will do just fine. The important thing here is not that all those famous artists, writers and painters are great because of owning a Moleskine, which is apparently not true. The important thing is that there must be something to these Moleskines that made all those great people choose these notebooks and stick with them. What you do is important not what you have. And if something can help you do better then it must be a good thing.